The construction will include curbs and gutters, signage improvements, re-striping and, where space allows, landscaping. The city will provide $509,700 in Special Purpose Local Option Sales Tax revenue for the $908,100 project. Mayor Charles Ivie announced the awarding of the grant at the City Council meeting on Wednesday night. Ivie said the city would begin engineering studies this summer. Right of way acquisition will begin in the fall. The city will let requests for construction proposals in January of next year, and construction should begin in April of 2018, Ivie said. 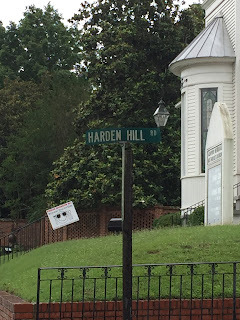 At the request of the city, the Oconee County Board of Commissioners on Feb. 7 of this year declared the abandonment of Harden Hill Road as a county road so it could become part of the City of Watkinsville road system. On March 14, the city applied for the grant from the State and Road Tollway Authority. The Tollway Authority announced on June 21 that it had approved funding for $23.6 million in grants and loans through the Georgia Transportation Infrastructure Bank. The Tollway Authority received 41 applications for funding, according to a news release dated June 21. The Tollway Authority awarded 18 grants, including the one to Watkinsville, and issued four loans. Grant awards ranged from $31,458 to the city of Ocilla in Irwin County in the south of the state to $1.5 million to a number entities, including the city of Johns Creek in Fulton County and Gwinnett County. Harden Hill Road intersects Main Street in the Center of Watkinsville opposite Simonton Bridge Road at the historic Ashford Memorial Methodist Church. From Main Street it runs to and crosses New High Shoals Road and then Macon Highway (U.S. 441 Business), where it turns into Old Bishop Road and continues to the middle of Bishop. According to the grant application, repeated by Mayor Ivie on Wednesday night, Harden Hill Road is one of the oldest roads in Oconee County. It was first recorded in the 1700s as a dirt stage coach road connecting Clarke County (of which today’s Oconee County was a part) to Madison in Morgan County and beyond, the application says. Watkinsville is working to encourage pedestrian traffic, the grant application states. The sidewalks on Harden Hill Road will allow many residents of the city to walk to downtown Watkinsville shops and restaurants. The project will incorporate water quality features along with storm draining improvements and landscaping. A pedestrian bridge over the creek at the low point of the roadway is part of the planning. According to the online documents submitted by the city, the application was completed by Watkinsville Council member Brian Brodrick on behalf of the Mayor and Council. The announcement of the Georgia Transportation Infrastructure Bank grant begins at 14:30 in the video below, which was recorded by Penny Mills. In other action, the Council improved a budget for the upcoming fiscal year that represents a 3 percent increase in total spending. The Council has not yet set the millage rate, pending final determination of the tax digest for the city, which states the assessed value of property within the city limits. The Council also passed a Solicitation Ordinance to make the regulation of door-to-door solicitations in the city identical to those in the county. The Oconee County Board of Commissioners, at its May 2 meeting, approved a solicitation ordinance requested by the Sheriff’s Office that requires prior registration of businesses wishing to do door-to-door solicitation and sets restrictions on sales techniques. OCO: Watkinsville Council 6 21 17 from Lee Becker on Vimeo. All that for under a million dollars, and engineering hasn't even begun.